Great heroes need great mounts to carry them into battle. 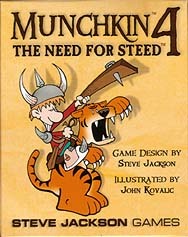 And great Munchkins need really obusively powerful steeds. Now we've got you covered. Gallop into the dungeon on the Tiger, the Dragon, the Giant Mutant Gerbil (illustrated by guest artist Shaenon K. Garrity of Narbonic), the Eagle... or even the Chicken... each one with the kind of unreasonable special power you've come to expect from Munchkin. This set also features a host of Hirelings, who look quite a bit like Sidekicks from Super Munchkin, or Minions from Munchkin Bites!, and yet are completely unique and new! Add these valuable characters to your retinue, use their special abilities, and sacrifice them to save your own skin! Or, better yet, kill some body else's Hireling. That's the way a real Munchkin does it!